I am so ready to hit the Caribbean in a couple of days. The clothes are stacking on the bed, so I better get them in the suitcase, so I can head out in the morning. Ran errands in all the snow this morning--I am so ready for this snow to be DONE!!! Headed to my sisters in Maryland tomorrow. She has us booked to get pedicures on Sat. am together. And then Sunday we are actually on the same flight as my cousins to head to San Juan, PR for our cruise to the southern Caribbean. I am ready for warm temperatures, palm trees and balmy breezes. Just since Friday, when I was working in the backyard things are changing. The tulips are popping their greenery through the ground and there are actually leaves starting to come on the trees. Curtis has reached his destination-Orlando and I am thankful for that. Headed back to work tomorrow. My sweetie is on the road again. He is not on the bike, but in the Pilot on his way to Fl.He was worried about following the snow system, that was here a couple of days ago and through Denver today. Also, he has been sick and didn't want to spend the week in FL taking Dayquil. He is in Scottsbluff, NE for the night--I think he said 684 miles today. But getting ready for his trip he found our little Nikon camera that has been missing since we went to Pheonix in the fall. And he couldn't find his cell phone for a while--packed in a bag. Just an FYI--he figured he has been on the road 10 weeks since he left on Jan 9th for Italy. And I counted there has been 14 weeks since then. I just wondered how we will get along in our little cabin on the cruise to Alaska? It has been a great day here--I got out and trimmed all the shooting suckers off the trees. Today is the day to post some new layouts, I have just finished. A little warmer out and it has stopped snowing. Curtis had to make a quick day trip to the Flathead for an interview. And he is on his way home. Supposed to be record high temps by the weekend. Springtime in Montana!!!! What the heck??? This is what we woke up to this morning and it has continued to fall for most of the day. What happened to that nice weather we had over the weekend. I am SO ready for my Caribbean cruise in about 10 days. Sun, warmth, tropical breeze--bring it on!! And Curtis is already talking about taking the Pilot, rather than the bike to Florida, as he will be following this system all the way to the east coast. Why doesn't he just fly, like most sane folks??? I am just chilling at home today, after working the last two. Will have the grandkids in a bit. was very nice with Kirsten and the kids here in the morning and a lovely dinner at Ft Benton. The grandkids have managed, yet again to share some bugs with their grandparents. We must build up our immunity. Harlee enjoyed her egg hunt, which you can check out on Curtis' blog. My pictures are of her checking out her loot. Breakfast was pretty yummy too. I have worked today, and the unit is a zoo, with 17 babies. Back tomorrow for more of the same. And why is thee another winter storm warning looming about. Especially since Curtis want to head to Florida for work meetings on Friday on the Motorcycle?????? 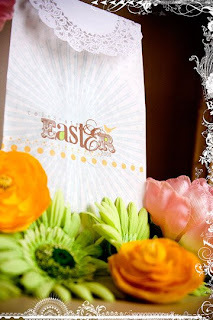 Happy Easter to all the family and friends that follow my blog. Hope you and your families have a very blessed Easter day. We are waiting for Kirsten and the kids to arrive to enjoy brunch together and a little Easter egg hunt for Harlee. Tim is at work. Then later today off to Ft. Benton for dinner with friends at the Grand Union hotel. Yum, yum. Had the grandbabies last evening while their parents were working. That was fun. Found out Harlee talks in her sleep, just like Auntie Cait. And Friday was an extra shift at work. We are very busy right now. Probably will post more photos later today. Cait, this one's for You! Since you can't be here to enjoy the humor of it---I had to share. Found this little egg from yesterday on the table. Harlee calls it a cow. The front is cute. But she got a little sticker crazy on the back---she is so her mother's daughter. Yesterday, Kirsten came over with the kids. We got Harlee involved with dying Easter eggs and cutting out Easter sugar cookies. I think she had a lot of fun. At least Nana did. Nichoas was here with us too. He managed to get himself up at the coffee table and pull flowers out of my arrangement on the table. He was quite proud of himself. Easter is almost here and look what I found in my backyard this morning hopping around. Loving this spring weather. Despite being dog tired all weekend I managed to complete one layout. Harlee having a tea party. Thanks to my friend, Robyn for the teapot dies--they were wonderful for this layout. Another busy day at work today, and back again tomorrow. Has been a long week for me and no time for blogging. Worked 50 hours this past week ,when I am used to working 24 hours, or even less since we have been so slow. So, you can believe I am really tired today. Had the grand kids last night, for the night and this morning. They decided to party, so between Curtis and I we are both short on sleep. I napped for 2 hours this afternoon. So, I better play some catch up around the house tomorrow. A few photos from this morning.